in a Hessian regiment, for instance? The Hessians are often referred to all the German mercenaries who participated in the ARW, no matter which principality they were from. I have given you a description of the regiment. But, in reality, the Hessians were not the only ones to sign a contract with Britain. Besides Hesse-Kassel, there were five more principalities who sent mercenaries: Waldeck, Anspach-Bayreuth, Anhalt-Zerbst , Brunswick and Hesse-Hanau. The article of Dennis Showalter sheds some doubts on the possibility that every soldier was a regular Hessian mercenary. Germany sent in America professional soldiers, but also other less trained combatants more or less willing to get into this risky business. (1) Philip said in a letter that he had been involved in the ARW since 1775. If he said so, then it must be true. It is very much possible since the first contingents of German soldiers arrived in the spring of 1776 in Quebec and New York. The Waldeck regiment arrived in New York in 1776. His experience with war seems to have started with the onset of the ARW. Did he register in the German army only when the army launched a vast recruitment campaign to fill a pressing order from Britain or was he already a German soldier before the ARW? He could have enlisted when he was only 18 years old. (2) Many of these soldiers didn’t go to the battlefield as soon as they arrived. It seems that many stayed in Quebec as guards. Could it be that Philip did not set foot on a battlefield before 1781, which would explain why his name did not appear on any muster roll before 1781? The timeline of the Waldeck shows that the regiment got involved immediatly after they had set foot in New York. Philip was not part of the Brunswick regiment that arrived in Quebec. (3) Philip appeared on a muster roll for the first time in New Town, Long Island, NY with the West Florida Royal Foresters on May 8, 1781. It doesn’t mean that he was present in New Town at that date, not at all. If he was a German soldier, what was he doing in the loyalist militia? Moreover, he is reported on the muster roll as « deserted ». When things go wrong, they really go wrong! This muster roll was taken five years after his arrival. 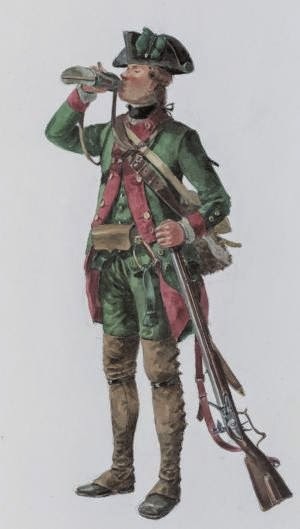 (4) Between 1776 and 1781, Philip could have been fighting in a German regiment. To answer this question, I need German muster rolls to figure out his whereabouts during this 5-year period. (5) Deserting from a Hessian regiment meant severe punishment. But, did Philip really leave the Hessian army? He is listed as « deserter » on a Loyalist muster roll. It seems that he deserted the German army first and, a Loyalist regiment one more time. Philip had a way to complicate the life of his descendants. During the ARW, many German soldiers deserted without getting the usual punishment. How come? (6) A few months later, after he deserted the West Florida Royal Foresters, Philip suddenly reappeared in the Captain Isaac Atwood’s Company, a Troop of Cavalry, on October 24, 1781, in Savannah, Georgia. The British and Loyalist regiments were having a hard time down south. 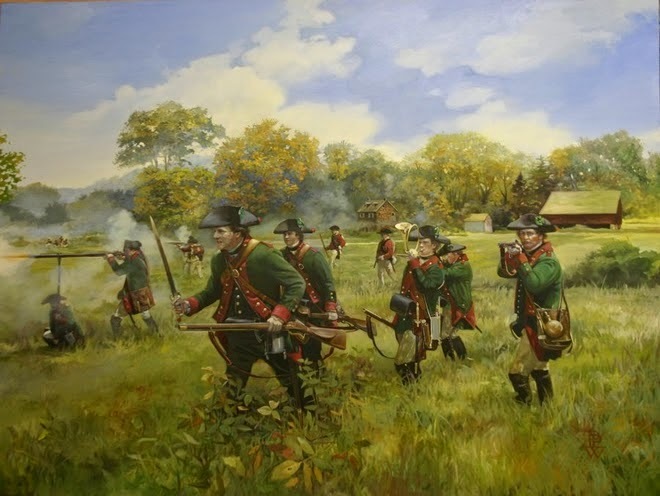 Some of these militia regiments were disbanded overnight and soldiers had to find another company to continue fighting and receiving a paycheck. Philip enlisted in another cavalry troop: West Florida Royal Foresters was a cavalry Company. Was he familiar with horses? Philip deserted from a loyalist regiment to enter another one: the swap was horizontal and not vertical. At this point, your explanation is just as good as mine. (7) In June the next year (1782), he is now enlisted in the newly formed militia company King’s American Regiment. In fact, Captain Atwood’s Company was part of the King’s American Regiment. This third muster roll was also taken in Savannah Georgia, the third one in a year. He was going from one company to the next, but all within the King’s American Regiment. Consequently and from then on, Philip was part of a loyalist militia and not part of the German army starting at least in 1781. (8) Many German soldiers deserted the ranks and chose to go as far as fighting for the other side. Leaving a German regiment for the loyalist militia could have been a mid-way solution for Philip, a choice readily accepted by the German officers who were facing defection on a large scale in the last years of the ARW. (9) The term « deserted » might mean, (a) leaving the army to fight for the other side; (b) leaving the battlefield to go back home; (c) leaving a German regiment for the loyalist militia. Just to be sure that I was on the right track, I read a book by Rodney Atwood, The Hessians. There is a whole chapter about desertion. I thought that I had this concept cornered. Well, I didn’t. That’s the reason why I devoted a separate section of my blog to DESERTION. His writings change my perception about desertion. Brace yourself, it’s pretty surprising! (10) Military documents will be necessary to claim beyond any doubt that Philip was a German soldier and not a British soldier. Philip said that he got involved in the ARW in 1775, but his name only appeared on a muster roll in 1781. And this was not a German, nor a British muster roll, but a loyalist militia (Provincial) muster roll. Where was he hiding between 1775 and 1781? (11) Such a document from the military archives would toss aside another hypothesis concerning his place of birth: that Philip was an American citizen at the onset of the ARW. It is still possible that Philip lived in Pennsylvania, for instance, that he was even born there and that he enlisted in the militia only at the end of the ARW. This door will stay wide-opened until I find documents that prove beyond any doubt that he was born in Germany and came in America with the hired German army, whatever his civil or military status was at the time of enlistment in Germany. (12) On that matter, I always keep in mind the fact that Philip identified himself to strangers as an American loyalist, who reported it in writing afterwards. That’s not a working hypothesis: it’s a vital document to be considered seriously. There is a danger in trying to give different interpretations of his words. Any twisting of meaning on our part could, down the road, prevent us to look in the right direction for vital documents about his life and his whereabouts in Germany and in America. (13) Nevertheless, we have never been able to find a birth certificate for any individual in America by the name of Philip Long/Lang who could fit reasonably well in the shoes of my ancestor. Either a candidate is too young, too old, lived in the USA after 1783, and so forth. Philip Long started to exist on this side of the Atlantic when his name appeared in a muster roll in 1781. Once he arrived in Canada, in 1783, many researchers were able to gather unquestionable documents about his real life from that date on. But, finding more birth certificates in Germany does not give more credence to the hypothesis that Philip was born is Germany. I am rather searching for a military document in Germany that would be linked, beyond any doubt, to my ancestor.